The Euorzone leadership remains uneasy with the third bailout of Greece. This unease can be seen in the recent delay to the start of the negotiations, with the Troika staff in Athens siting "technical issues". The actual reason has to do with the fact that Greece's creditors have yet to reach an agreement among themselves. Apparently some Eurozone nations are still pushing for additional requirements that go beyond the austerity measures the Greek parliament recently passed. The challenges surrounding the new bailout are severe. The intrusive nature of reform enforcement by the creditors is likely to worsen the already intense animosity in Greece toward the Troika institutions. Bloomberg: - Previous memorandums committing Greece to enforce reforms on everything from the rules of bank recapitalizations to evaluating the “impact of the changes in milk pasteurization and sale procedures,” have prompted dissenters to claim that Greece has turned into a “debt colony.” Creditors argue that changes are necessary to stabilize the country’s finances and set it on course to sustainable growth. Furthermore, the negotiations will once again be taking place "under the gun" as the next payment to the ECB of over €3bn is due on August 20th. Assuming the deal will be completed in August as the can gets kicked much further down the road, Greece is being set up for a massive maturity wall, with little chance of principal repayment. And any form of debt principal forgiveness is off the table. Natixis: - [Greek debt forgiveness] is unlikely to come about given the opposition of many Member States (Germany notably), the position of the Eurogroup over this issue (“nominal haircuts on the debt cannot be undertaken”) and the legal obstacle (measure would be in breach of Treaty). Under these conditions, this leaves one option, namely a re-profiling of Greek debt without touching the principal. 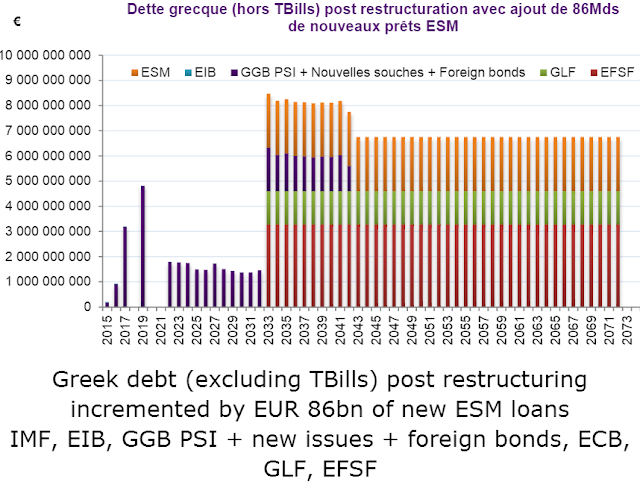 According to Natixis here is what the liability term structure is expected to look like after the completion of this third bailout. How Troika lenders can possibly get comfortable leaving a small nation with this type of a debt profile is unfathomable. And yet, this is the most likely outcome of the upcoming negotiations.